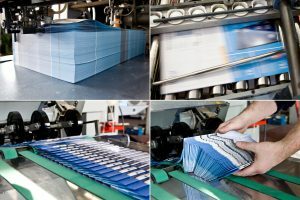 As an individual using a laser or inkjet printer in your office or home, you might think that’s how most printing happens now but offset printing is more likely how most of the printed materials you handle on a daily basis are made — especially fliers, newspapers, booklets, magazines, and other large-quantity printed materials. We offer offset printing services so you can have high quality, large volume printed products at the lowest possible cost per piece. Contact us if you have any questions or would like to get a quote. The process of offset printing involves a set of three cylinders per color. The most common colors are Cyan, Magenta, Yellow, and Black (aka CMYK, where the “K” stands for “Key”). Each set applies one layer of color to the printed material as the material moves through it and onto the next set. The first cylinder in a set is mounted with the printing plate (of the image) and transfers the image onto the second cylinder (called the offset cylinder because it spins in the opposite direction) which reverses the image and transfers is to the print medium (paper, wood, plastic, or any number of materials). The third cylinder, which is also known as impression cylinder, supports the material to ensure even pressure and continuous flow through the machine. Once the material has gone through each color set, the image is complete. It’s that simple. If you need to print a lot of an identical item, offset printing will be your most cost-effective option. That is why offset printing is the most widely distributed type of printing nowadays. The primary element offset printing and digital printing have in common is the four-color flat printing approach. However, the processes they use are quite different. While offset printing uses etched metal or plastic plates that apply ink to a sheet of paper, digital printing uses electrostatic rollers known as ‘drums’ to apply toner onto the paper. No initial setup is required for digital printing so it is safe to say that digital printing is more cost-effective for small print runs. 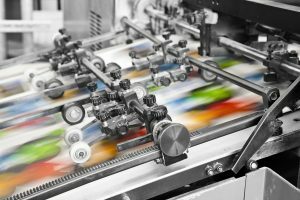 Perhaps in the future, the cost per piece for digital printing will become so low that offset printing becomes obsolete. For now, though, offset printing has a solid place in our business because it means we can produce high volumes of printed products such as fliers, booklets, brochures, envelopes, invoices, postcards, and other printed materials for you and your business at the lowest possible cost per piece.